WE PROVIDE VERY PROMPT AND PERSONAL RENTAL SERVICES. I answer phones 24/7. We live minutes from this condo. We, the owners often clean the unit ourselves. We replace bedding, towels every couple months. We paint and 'deep' clean the unit every chance we get. Long beach resort has one of the kind floor plan: All rooms are ocean front. All rooms have floor to ceiling windows. There are only 6 units on each floor. Ground is large and beautiful! 3. king-size bed in master bedroom, 4 queens in 2 guest rooms. a leather couch bed in living room. 4. walking in closet, double vanity, double sink, garden tub in all 3 bathrooms. We are hard working 'young' retirees who love the beach and people. floor plan, floor plan. All rooms are ocean front. We were a group of 9 and we found our condo perfect. The condition was excellent and it had all of the necessities for a week at the beach. The owners are absolutely amazing...very accommodating. This place was spacious enough for 5 adults and 6 children. Love the 3 separate bathrooms. Beds were comfortable. The only negative was that there was not a walk in shower. Bathtubs were deep and it was awkward getting in and out for us shorties. Other than that everything was fine. Would recommend. The condo was great. It had everything we needed and then some. The beds were comfortable as was the furniture. The outdoor furniture was more than enough to accommodate our family. Although we didn't use them, it was nice to have beach chairs available. The water pressure in the showers was excellent! The two heated pools were also a very nice feature. You couldn't ask for a better view! Thanks Anna for sharing your beautiful condo with us! Long Beach Resort is in an area where it can be very crowded, but it does not feel crowded here. You can look down the beach to the East & West and see big crowds, but because LBR buildings are wide and low, there is plenty of beach space in front of them. Parking was good (no walkovers or parking garages), and no waits on elevators. I have stayed in places where those issues became deal breakers for us. Anna was very responsive. When we arrived, the cleaning crew was finishing up and we got an early check-in. However, they locked the door when they left in a way that the keypad wouldn't work. Had to call Anna and she picked up the phone before the first ring was done. Had us in the room in 2 minutes. The condo was very spacious. There were 12 in our party and we did not feel crowded. There is a lot of storage areas/closet space. The balcony furniture was nice and sturdy, the kind they use around the pool area. There were a few things that could be improved, but would not stop us from renting this condo again. The furniture/décor could use some updating, but our group doesn't need anything too fancy. The bedding needs replaced. The dryer took 2 cycles to dry a load of towels. And we never did figure out the TV's, but that was probably just us. All in all a great stay and Anna was a perfect host! Thank you! Thank you! Your great review is so appreciated. 50% of our guests are happy repeats. We don't receive reviews from them anymore. But we are very happy that they are happy with us. 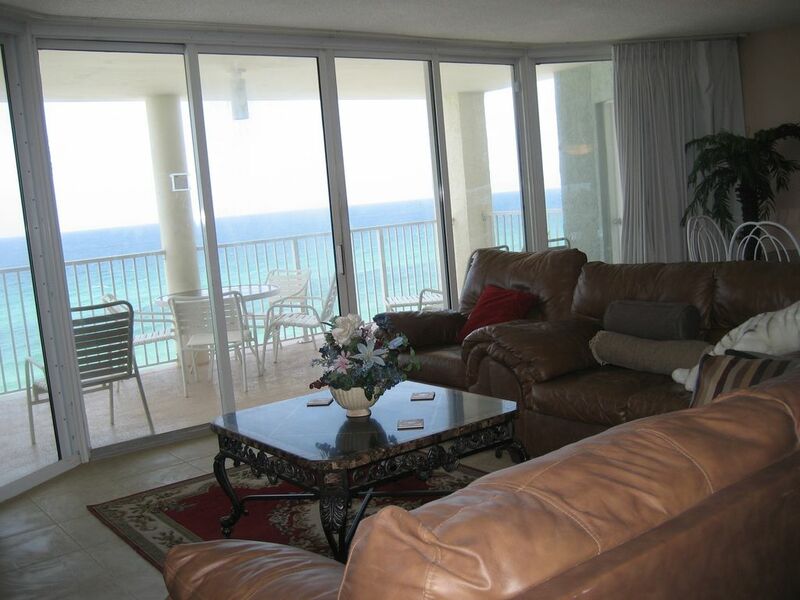 Beautiful view - wonderful pools and beach - super nice condo and owner! Nice stores right across the street! We've been coming to Florida for 7 years and this was our best trip! Anna's condo is very nice and she is great to work with! Everything from the beginning till the end was great. The property was beautiful, everything was perfect, we did not want to leave. Long beach resort is next door to Pineapple Willy's, cross street from Wal-mart, and Ripley's believe it or not.